The two main bloom spectacles in June are from roses and delphiniums. This rose is a type whose name is unknown to me but it’s obviously a tough one, since it grows between two Norway maples, slings itself into their branches and blooms with abandon. 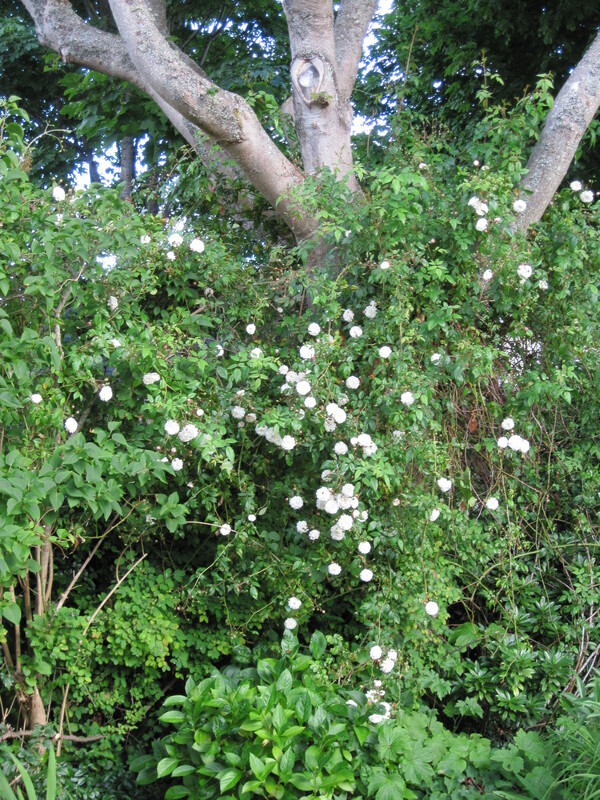 The flowers are very full, white with a pinkish tint, and fragrant. 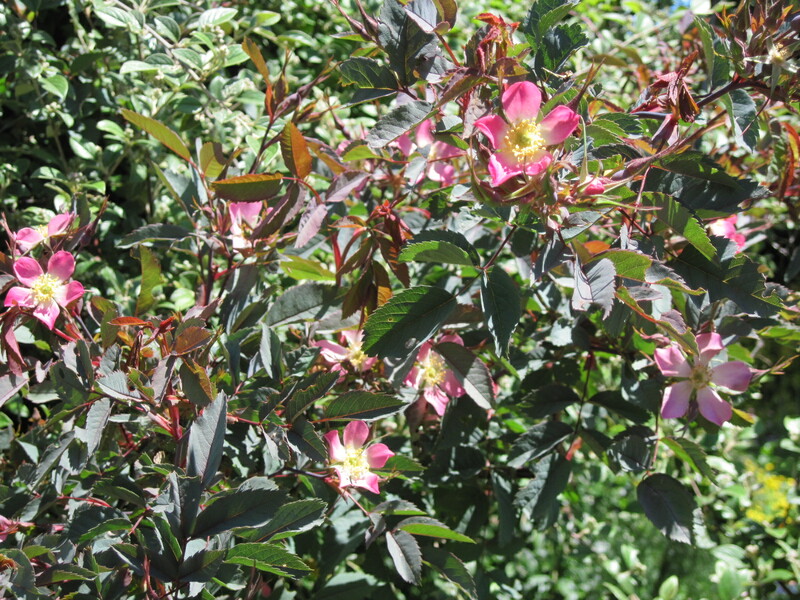 Another rose that blooms hard in June is Rosa glauca (formerly Rosa rubrifolia), the red-leaf rose. The leaves aren’t really red, but a sort of blue-green with reddish overtones, quite unusual. The flowers are tiny and not much to look at individually, but a pleasing sight in quantity. 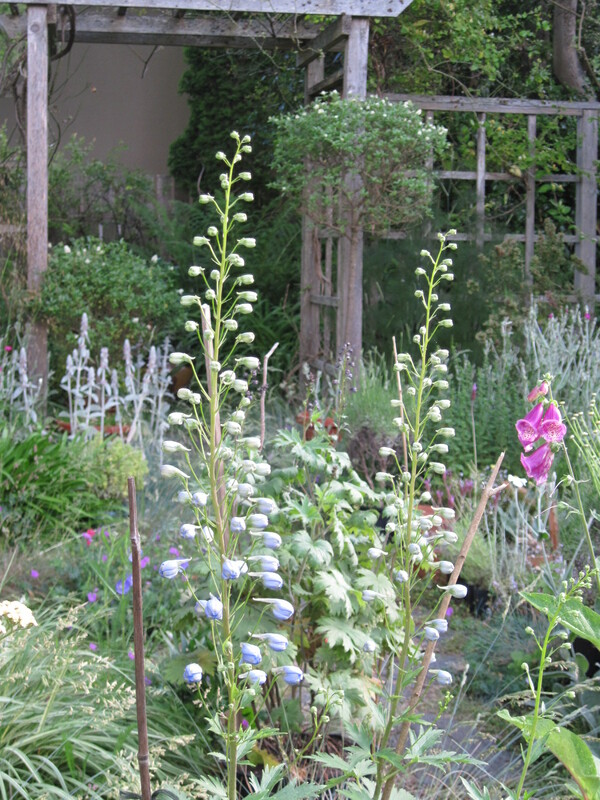 Delphiniums are in full bloom now, but I like them best when they are mostly still in bud, with just a few flowers open — great anticipation! Mulleins have this effect too — their growth from rosettes of great big fuzzy leaves up to the point they burst into bloom is a prolonged event. 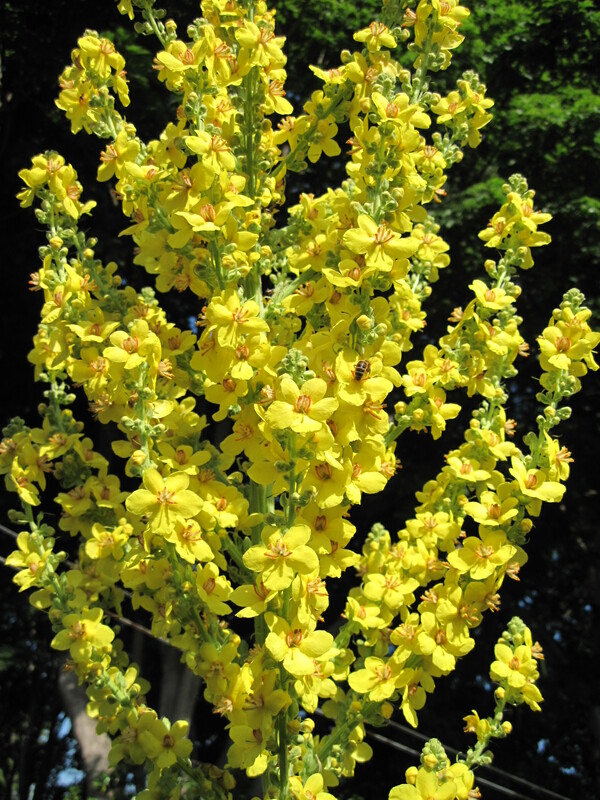 Once in full bloom they are abuzz with bees. 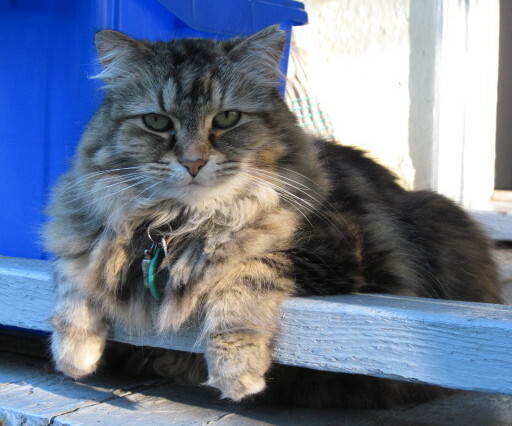 And we are having sunshine and the first really hot weather of the season (28 C), but there is sadness too because of the death today of our cat Zoey, who had lived here since 2000. She was a sweetie. The garden won’t be the same without her. Summer was late in arriving this year, but now that it has, it appears to be here to stay for a while. Record high temperatures are forecast for the end of next week as the dreaded thermal trough develops off the Washington coast. This phenomenon has not manifested so far this summer, so I shouldn’t really complain, even though I’m not a heat lover. Besides, with sunset occurring before 8 p.m., things cool off pretty fast in the evenings, so I don’t expect the hot nights that would happen in a July heat wave. And the garden? Well, it looks tired and past its best, the way it should at the end of summer. Once September starts, though, I begin to look for that subtle season I call the “fall spring,” when, after a few rains, plants revive and some even flower a second time. The tired look vanishes, and even though the late-season state of things prevails, a modest beauty creeps in. But the last time we had measurable rain was on August 22, and before that on July 21. On the other hand, it has turned out to be a promising year for tomatoes, after a rather bleak start. 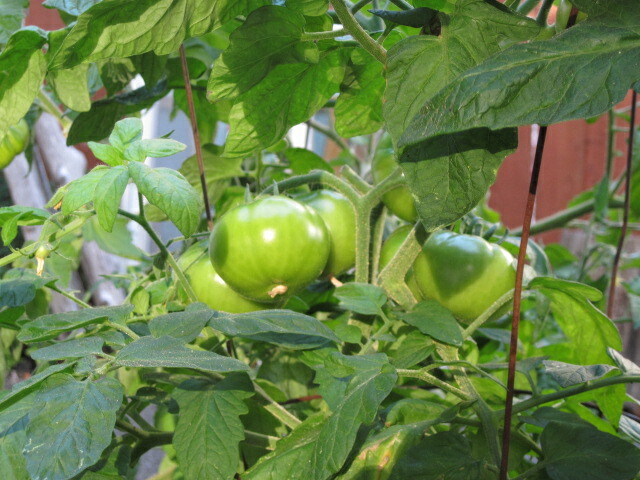 In mid-July I would not have believed that there would be trusses of big tomatoes on the plants that at that time had only flowers and pea-sized fruits. And without rain, there is less chance of late blight disease, which causes brown spots and eventual rot, rather than ripening. A few things are in bloom — not reluctant, end-of-season bloom, but new and fresh — notably a dark blue delphinium that I dug up from one of my tree-root-infested perennial beds and transferred to a pot. Like its paler blue and pink fellows also living in pots, it has prospered and is blooming, late in the season when most other things are in decline. The thing is to appreciate what is there and stop fretting about everything else. In gardening as in life. This is a double long weekend — Friday, July 1 was Canada Day and Monday is the Fourth of July. After a rather cold spring, it finally feels something like summer here on the west coast. Conditions are therefore in place for one of the best ways to savour a summer day — watching bees. 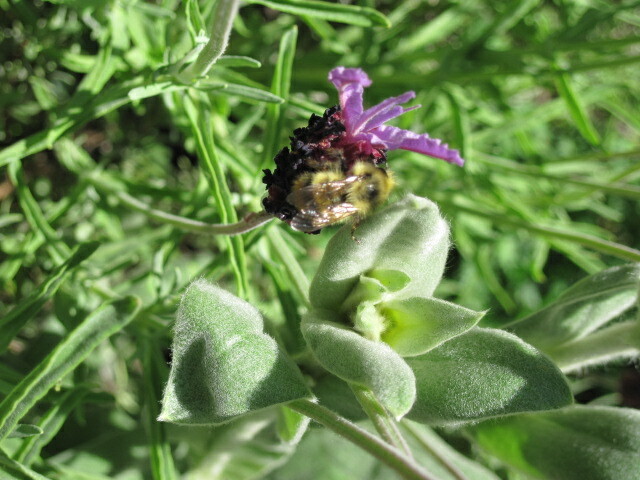 The garden probably contains more bee-attracting blooms right now than at any other time of year — foxgloves, peach-leaf bellflower, campion, toadflax, lavender, hardy geraniums, mulleins and more. 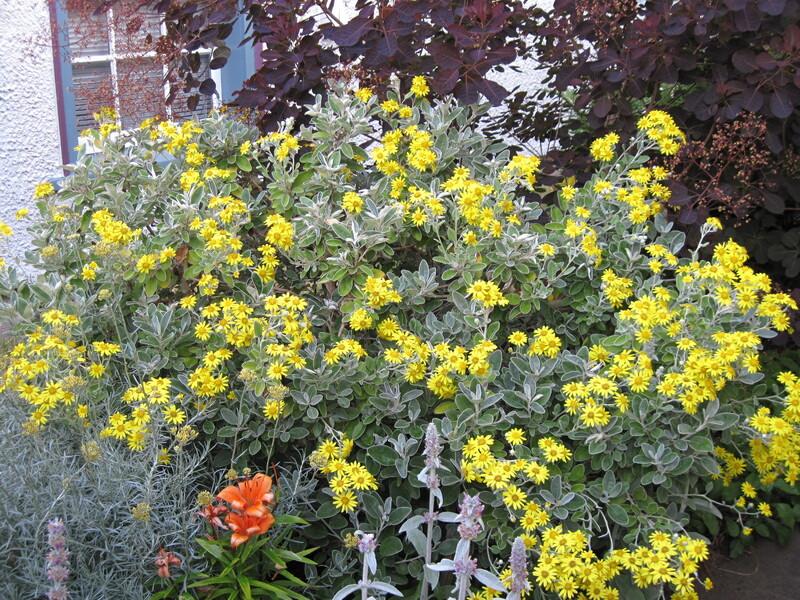 Not to mention shrubs like cotoneaster and privet, whose small flowers may escape human attention with so many flashier ones around (roses, for example), but which are of great interest to bees, and are quite numerous besides. You can’t go wrong spending part of a warm July morning watching bees doing their thing among abundant flowers. One thing that becomes immediately apparent is how many different kinds of bee-like insects there are, everything from what look like tiny wasps to honeybees to bumblebees of varying sizes, to real wasps and hornets and some creatures that look like a cross between wasps and giant ants. I have to admit that I haven’t as yet been motivated to learn what all these bees and others are, but noticing their variety is an experience in itself. Among the bumblebees there is an amazing variety of colours and patterns, different arrangements of black, yellow, white and orange. Some bees have prominent pollen sacks, others don’t. A single flower may be visited by a number of bees, while others are ignored. Watching all these happenings is interesting enough to engage the brain but requires no effort or decision on the watcher’s part and is therefore not in the least taxing. Photographing bees, on the other hand, is not at all easy. By the time you focus and are ready to shoot, the bee is gone or has moved around to the other side of the flower. 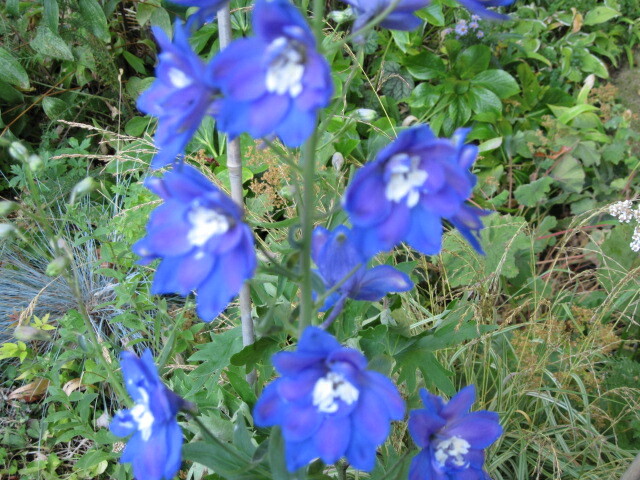 Or you notice a bee hovering around the delphiniums, for example. 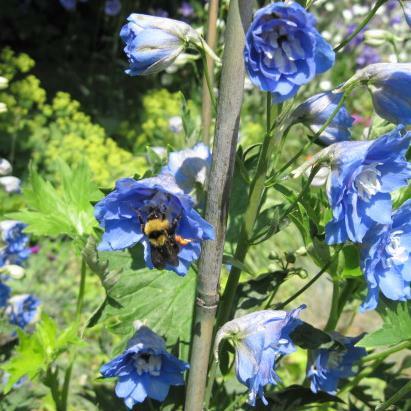 Remembering that the centre parts of delphinium flowers are called “bees,” you think What a great picture! and race for the camera. When you get back, the bee has departed and does not return. I did manage to take this picture, however, and have now decided to end my experiments in bee photography. Bee watching is too rewarding an activity to spoil with the anxieties of capturing the experience for posterity.